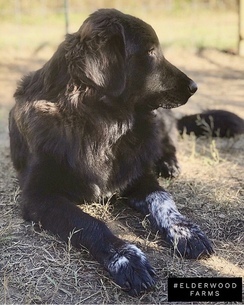 Bruce, one of our livestock guardian dogs. He's a Karakachan - a breed that originated in Bulgaria. He keeps everyone safe from harm! 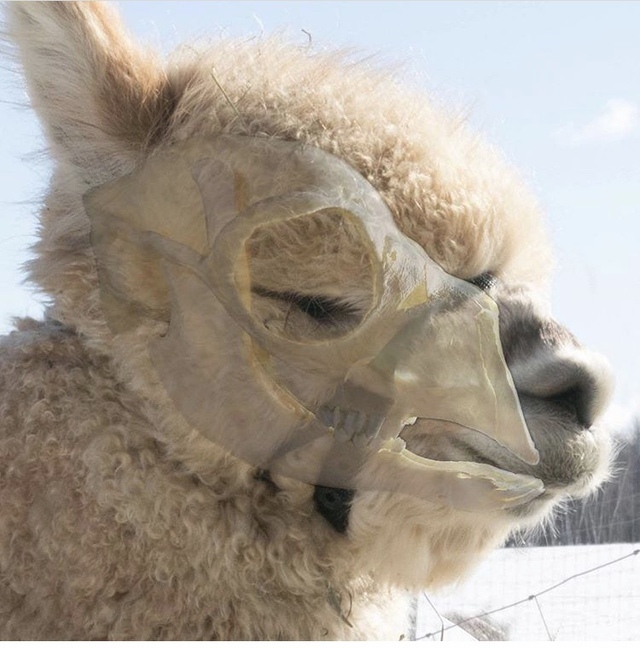 Due to the alpaca skull structure, the halter needs to sit high on the face so that it does not obstruct the nasal passages and inhibit breathing. Our alpacas are shorn on the ground using a pully system to keep everyone safe. 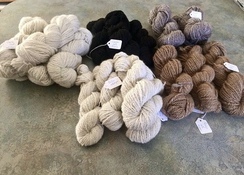 Finished yarn produced by Elderwood's very own alpacas. We are thankful for a vet who loves learning! There are numerous publications out there for self-education. Welcome to Elderwood's Alpaca 101: Facts and Fun! 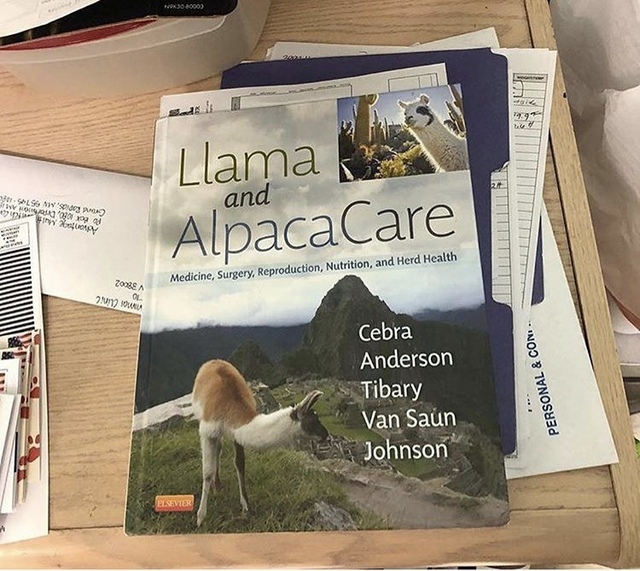 Here at Elderwood Farms, we think it's of the upmost importance to do as much research and learning as possible prior to bringing home your first alpacas. There's always room for furthering education as well, so don't stop here! We are always learning something new about these magnificent animals. 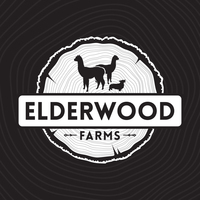 Elderwood Farms is dedicated to the guidance and support of new farm owners. 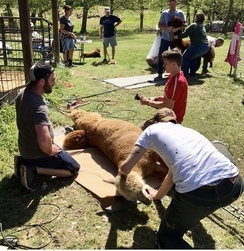 We will share what “works for us” and other industry best practices for alpaca care. Keep in mind, this doesn’t mean that there aren’t other “right” ways of doing things. Alpacas are members of the camelid family, which also includes llamas, camels, vicunas, and guanacos. Alpacas are a domesticated breed of camelid originating in South America. Adult alpacas range in weight anywhere from 100 to 250 pounds and typically stand between 32-39 inches at the shoulder. Alpacas typically live anywhere from 15-20+ years and come in 22 natural color varieties. There are two breeds: Huacaya and Suri. Huacayas are what we breed here at Elderwood Farms. They have dense fiber that grows out in crimpy waves – usually giving the fluffy, teddy bear look. Suris look more like mops in full fleece. Their fiber grows down and twists into locks. Baby alpacas are called crias. Alpacas are typically quiet, but they do hum, orgle (when breeding), and alarm call when alerted. Alpacas are communal poopers, so they all go in one place. We aim to clean up poop piles once a day, but a few times a week should be sufficient for a small herd. Think about AOA for alpacas like you would the American Kennel Club (AKC) for dogs. AOA houses the heritage of any registered alpaca in the United States. Through AOA, you can register and transfer alpacas, search and sign up for shows, research pedigrees, house information pertaining to your animals, have access to a wealth of information, etc. AOA is a little stricter than AKC – you have to submit a blood sample for DNA testing to prove parentage (which is a great thing). Even if you don’t make a purchase from Elderwood, we recommend that you buy registered stock. There are a few reasons for this. First, we can trace registered stock and their history to better keep up with ages, offspring produced, dates of death, and to ensure that inbreeding does not take place. Also, you may want to start as a hobby, but it could turn into more. If you ever decide to breed, both parents should be registered. Registered stock is much more appealing to the serious buyer than unregistered animals. You may also want to show your animals one day, and show animals need to be registered. Better to be prepared for what might happen – alpacas are addicting! You can set up a free account with AOA and upgrade it at any time. Through the free membership, you can manage your herd, as well as, register and transfer animals. Here in the U.S. (especially in Memphis), we often have extremes. Really hot or really cold – and it can be totally different the next week. Alpacas come from a climate that is more stable, so we do take precautions based on individual needs and geographical location. For the MOST part, alpacas really don’t need more than a 3 sided, run-in shed in this area. Something to get under when it’s raining. Something to provide an escape from the sun or the harsh winds of winter. That being said, young animals and old animals may be more susceptible to heat stress or chill. You can provide fans or wading pulls in the summer months as cooling options, but not everyone does. We prefer to use the water hose on their undersides versus pools (we are careful to only wet their legs and undersides – wetting their backs can actually cause them to heat up as their fiber is water resistant). We don’t like them drinking the dirty water where they have been putting their feet – this could lead to parasite problems. Crias may need to be coated in the winter, but it is rare here if they have a good fleece on. We typically go by the 40-40 rule. Under 40 lbs and under 40 degrees, they get a coat. We do sometimes put down straw beds for extra comfort, but if it snows, ours are often seen lying out in the field. We use Red Brand no-climb horse fencing for our perimeter. We never have to worry about animals getting out or getting heads stuck. It also provides a tighter barrier for predators to pass through. Believe it or not, dog attacks are the number one “predator killers” for most areas. We also incorporate livestock guardian dogs here for an extra safety measure. We also prefer to have a smaller “catch” area (typically attached to housing) enclosed. We use this area to feed the animals, as holding areas, or if we need to dry lot them from pasture. It’s also a great way to catch them if you feed them there every day. This can easily be set up using the same fencing as your pasture, but we prefer to use panels that can be adjusted and moved around as necessary. Keep in mind, males should be kept separate from females. It is also a good idea to have a space for weaning crias too. You can generally graze 6-8 alpacas on one acre. Housing size really depends on how many animals you plan on having. There are a few sites that we order from when it comes to supplies. Between them and local farm stores, we have been able to find everything that we need from halters and leads to water buckets and feeders to rakes and scoops for cleaning. A list of sites is provided below. Please be sure when selecting halters that you pay close attention to the fit. A picture to the right shows proper fit and the reason behind it (Photo credit: Alpagas Fibrefine). It's also important that you don't use items that alpacas can get hung up in or choked by. Alpacas are modified ruminants, and they do chew cud. It’s important for them to have forage at all times to keep their systems running like they should. We offer hay at all times – even if they have access to pasture. We feed second cutting orchard grass hay, but others have had success with bermuda, crab grass, and timothy mixes (keep in mind that the seed heads for timothy are horrible to get out of fleece). Whatever you decide on, just know that alpaca hay should not have extremely high protein levels (12-14% is good). Also, they do prefer soft, leafy hay - they will often eat around coarse parts. We also feed grain. We use Mazuri brand alpaca food. Mazuri makes a few different types depending on the animal’s need. We sometimes supplement our nursing moms, older animals, and growing animals with chaffhaye, beet pulp, or alfalfa. As far as mineral supplements go, we always have Stillwater Minerals available free choice to help meet any nutrition needs that the alpacas may be lacking. We use Llama Min -104. You can purchase Stillwater Minerals at the link listed below this article. Of course, alpacas should always have access to fresh, clean water. Most prefer hanging buckets as alpacas are notorious for sticking their feet in water when it’s warm out. Alpacas should be shorn once a year. You don’t want an animal to suffer the heat in full fleece. We typically shear in late March or April (this will depend on where you live). There are a number of teams that travel around the U.S., but we typically use Biosecure. We do own a shearing table and shears, so we do have the ability to shear if need be, but with a herd our size, it’s much easier to have a team come in and shear in a couple of hours. We do allow others to come in for shearing by sharing the setup fee. Don't forget your fiber! There are so many uses from alpaca fiber which can be sold raw, in yarn form, or as finished products. Alpacas, like rabbits, have teeth that grow continuously. For the most part, eating and grazing keeps them trimmed down, but sometimes they do need to be trimmed. We usually have ours trimmed at shearing if they need it, but you can also use a tooth-o-matic or dremel if trimming needs to be done. Toes are trimmed at shearing in the spring, and most of the time again in the fall if needed. Goat or sheep trimmers seem to work fine. There are a number of medications and de-wormer products that are available over the counter that can be used successfully for alpacas. Many times, there are “go to” medications when your animal is acting off. As with most mammals, there are general issues that might arise like ear infections, mites/lice, eye issues, abscesses, tooth problems, ulcers, broken bones, etc. These aren’t things that you will deal with often – if ever. It’s always good to have a camelid veterinarian close by, or a vet that is willing to learn. Internal parasite problems are probably the most overlooked issues in the alpaca world for new owners. It is important to do fecals properly or to have them done by a trusted veterinarian to ensure you aren’t having any issues. More often than not, physical signs don’t start showing until a heavy load is established. We do not do routine de-wormings here at Elderwood. We do fecals and worm as needed to help prevent parasite resistance to current medications. We now do our own fecals here, but MidAmerican Ag Research is a great place to send samples if need be. The only thing that we do monthly is Ivermectin injections to prevent Meningeal Worm. Anywhere with a white-tail deer population runs a risk of meningeal infection. Deer pass the parasite on through their droppings. It is then picked up by snails and is usually contracted by an alpaca eating one (on leaves or grass). That being said, it does attack the alpaca’s nervous system and causes swelling on the spine and brain. It can be successfully treated if caught early, but it’s safer to prevent than treat. Alpacas are an end host for the parasite, so they cannot spread it to each other. Male alpacas typically become sexually mature anywhere from approximately 1-3 years old. Females can become sexually mature starting as early as 16 months; however, we do not recommend that you breed them until they are 18 months to 2 years of age. It is important to keep males and females separate. We don’t have any males with females after 8 months of age and typically wean around 6-8 months. One reason is to ensure you don’t have unwanted births. Another reason is so that you can time when the cria is born. You don’t want a baby in the middle of the summer if you have extreme heat or the middle of the winter for those with extreme cold. Also, males can cause infections for girls or make them abort through continuous breeding. Alpacas don’t have an estrus or heat cycle, although they do 2 week waves of optimal breeding times. They are induced ovulators, so the act of breeding itself causes ovulation. When females are ready to breed, they will cush (or sit down) for the male. Males will mount the female and will orgle. Breeding can take place for up to 30 minutes are more. We do hand breeding here (we choose the male and female, halter them, and observe the breeding). Females typically spit at males when they are pregnant, and they can be “tested” at around 5-7 days. Pasture breeding is also an option where you add a male to a group of females for a 2-3 week period. Gestation is typically around 11 to 11.5 months, but a cria that is two to three weeks late or early is completely normal.